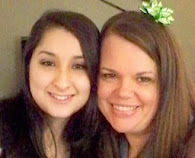 Jamie's eyes looked weak to me today... me and Jamie-gurl today... Me and sister a year and a half ago... I think I had a better hair day today... I was (intentionally) wearing the same dress. Pastor Daddy helps Jamie into the baptismal pool Flashback to Sarabeth in July 2009... they look identical, don't they?